All throughout the fall and early winter Sidney and I would go to the YMCA every Thursday night for an awesome Cardio Funk class. When Lem quit teaching it at the end of January we quit going. We just knew that it wouldn’t be the same. 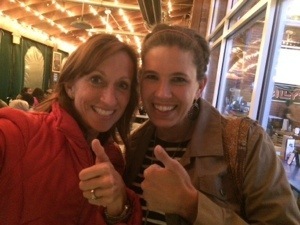 Four weeks ago we found something new and exciting to do on Thursday nights: Trivia! By the end of the first night we were hooked! Of course the fact that we have won every week, and received a gift card to help pay for our tab, has certainly been part the inspiration for returning. Sidney is a one woman show when it comes to trivia. I am not much help. I can justify that I am part of the team because I typically can help with two or three of the questions – we need those to win too right? There are eighteen questions in all and the final question is like Final Jeopardy – we have to wager a certain number of points. Now we just wager them all. Go big or go home! So far we have come in second place three times and first place once. Most of the time it is just Sidney and I playing, talking and laughing together. It is a great night out for the two of us. One week I invited some of the teachers from the Little Church preschool where I work. They loved it. They are asking to return and play another night. I think that we may have a rather large crowd next week because a girl from our dance class at the Y wants to meet us there too…another convert. The funny thing is that I find myself listening to NPR hoping to learn a bit of useful information. One night I even got on CNN.com to catch up on the news and then caught up on my pop culture knowledge as well. Anyone that knows me well knows that this is very unusual. I am completely withdrawn from what goes on in the world. I don’t watch the news, read newspapers or listen to the radio very often. I laugh and say that WW3 could be going on and I would never know it. I am blissfully ignorant of anything that goes on beyond my interests and daily travels. Trivia has motivated me to use my brain a bit more because I am realizing it is turning into mush and I am only 41 years old. It is time to reverse the damage from years neglecting my brain. All kidding aside, Sidney and I have a great time on Thursday nights. Yes, we have gone from working out to drinking beer and eating peanuts, but we are still together doing something that refreshes us from our daily lives with children. We feel like fun women again and that is what really matters. Winning doesn’t hurt either. This entry was posted in Uncategorized and tagged Becca, billys, boardwalk, sidney, trivia, win on March 29, 2014 by Becca. Last month I wrote about all of the terrible things that goes into our food: high fructose corn syrup, GMOs, artificial colors, etc. One of my friends said that I pretty much made her afraid to put anything into her mouth. I can understand that fear. I think about it all the time. Well, I am hear to tell you that there are many things that you can buy that you are already eating – you just need to change the name brand. I thought that it might be helpful to give everyone some of the foods that I buy from Walmart and Costco that are either organic or Non-GMO Project Verified with no artificial colors or preservatives. This may help to make your shopping easier and less overwhelming when it comes to buying quality items. You also see that we are no strangers to processed food. My kids love granola bars. They also love a good sugar cereal. I believe that I need to give them some of the fun things in life (like sugar cereals) but I just need to buy the right kinds. I hope this helps…. Like all kids, mine like sugar cereals. 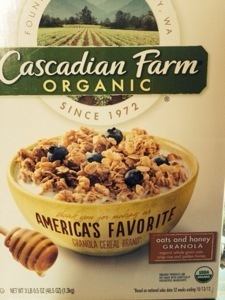 Luckily, Cascadian Farms make an organic version of Cinnamon Toast Crunch and it is sold at Costco. The granola cereal is not certified gluten free but is probably gluten free. Both of these are sold in a giant box for under $9.00 at Costco. When it come to cooking, here are a few that I use. I buy these four things at either Walmart, Harris Teeter or Trader Joes. Trader Joes also has a great selection of pasta sauces and organic rice pasta for under $2.50. The coconut oil came from Costco, is organic, and is a giant tub of the stuff for only $10.00. For bread we use the following two brands: Organic from Costco or Ezekiel bread which can be bought at any grocery store. They cost about $3 – $5 per loaf depending on where you buy it. Totally worth it. 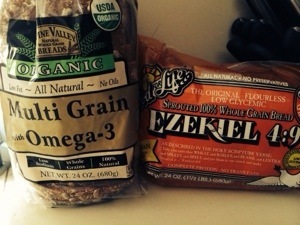 Check out the ingredient list on regular bread and then compare it to these. Other bread has a huge paragraph of ingredients, these do not. As for meat, I should buy my meat from the farmer’s market, but again, that isn’t the most convenient. I buy the organic chicken and organic, grass fed beef from Costco. 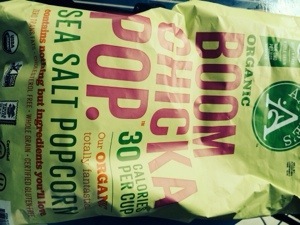 Probably not the best since it isn’t local, but better than the other stuff. As a mom, I can’t go to more than 3 different stores for my food. I usually buy everything at either Costco, Walmart, or Trader Joes. 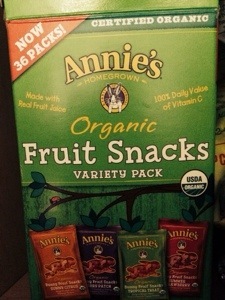 It gives me the variety I need and I can get almost everything organic from those three places. For dairy products I try to only buy organic, if I can. Sometimes the cheese, cream cheese or sour cream isn’t organic because it is too difficult to find. Stoneyfield yogurt, Silk unsweetened almond milk, Silk almond chocolate milk (which I cut with the unsweetened almond milk), and organic cheddar cheese from the grocery store is what I typically buy. You can get the Silk Milk, Yo Kids squirt yogurts, and the organic butter at Costco as well. My kids love the squirt yogurts. Can you tell that Costco is my favorite store these days? We also buy organic cows milk which I don’t use all that often, only in cereal and if Faith’s wants regular milk to drink. Silk almond milk is non-gmo. Needless to say, all of this takes a little effort and a little more grocery money. I find that it is totally worth every penny. 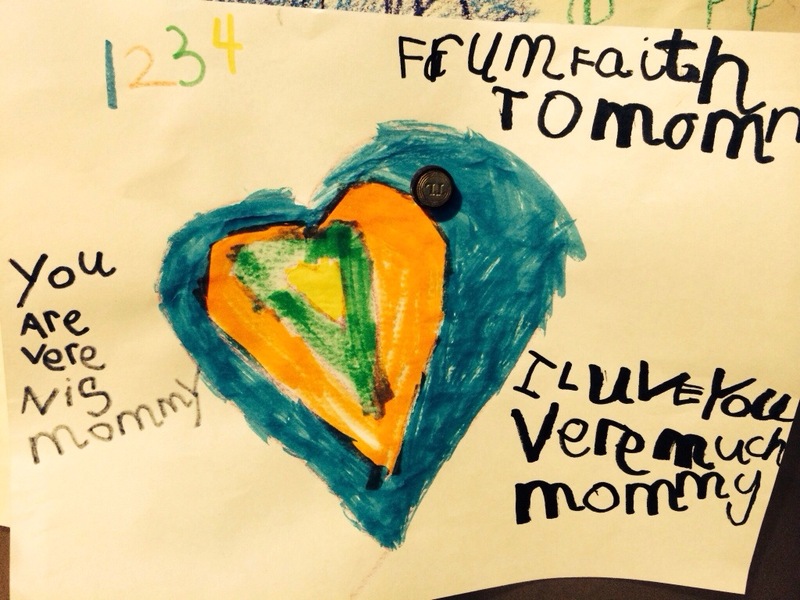 My kids’ health now, and in the future, is worth the extra work. Honestly, you get what you pay for and right now cheap food is so full of chemicals and toxins that I wouldn’t feed it to my dog….if I had one. Take the extra time to find quality food for yourself and your family. It really isn’t that hard if you are willing to read a few labels and travel to a few different stores. I even bought some pancake mix and gluten free flour on Amazon. It was shipped right to my door at no extra charge. There are so many places to go to get good quality food for you and your family. What is more important than your health and what you put into your body? I hope that this trip through my kitchen cabinets was helpful. Now go and buy some of it! 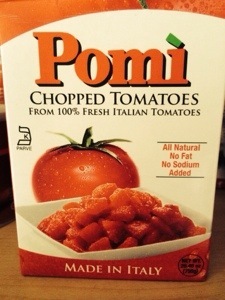 This entry was posted in Uncategorized and tagged groceries, grocery, organic, suggestion on March 26, 2014 by Becca. We have been without television for exactly two weeks. It is the best decision that we have made in a long time. Within two days of the tv going off, the kids stopped asking for it. Their imaginations have been used so much more. That Saturday they put on a parade and a show for us. The mornings flow smoother and there is less crying now that the tv isn’t on. At night, instead of having movie night the kids play Monster with Tom or go to bed earlier. It has truly made the house calmer and quieter. As for Tom and I, we miss the tv more than the kids. We really like our night time routine of vegging out in front of the TV. Although I miss it, it has been great having it off. Tom and I talk on the couch after the kids go to bed and spending more quality time together. I have tried reading but can’t really get into the book that I have started. I need a new one. Sometimes we end up sitting next to each other while doing different things. It is very quite, but sometimes I find myself sitting on the couch not wanting to read or think…my brain hurts to much. This is when I really want to tune out the world and watch TV. Eventually I find something to do or I go to bed. I have yet to find what entertains me. I am getting the itch to paint something so Tom better watch out! It may be project time again. All in all, having the TV off has been a great idea. After the six weeks I am sure it will go back on again but some of these patterns will stick. Overall I have seen a great and positive change in the house and I know that will we not go back to the way it was. This entry was posted in Uncategorized and tagged lent, no, television, tv on March 21, 2014 by Becca. I am going to keep all of these so that I can show them to her when she is sixteen and thinks I don’t know anything and that I am mean because I won’t let her go out with a certain boy. I know that day will come but I will continue to pray that it doesn’t. Right now, she is all about Mamma. She wants my attention all of the time. Sometimes it is difficult to do or I am tired because it is the end of the day, but I always remind myself that she won’t always want to be with me all of the time and that I need to take advantage of these moments now. The best part of my day is when she and I go downstairs right before bed to read. She reads her books from school and then we talk about our day. It is special because it is just the two of us and I am focused soley on her. She is growing up so fast and says things that make me smile. I am sure that more cards are to come and I will cherish everyone of them. 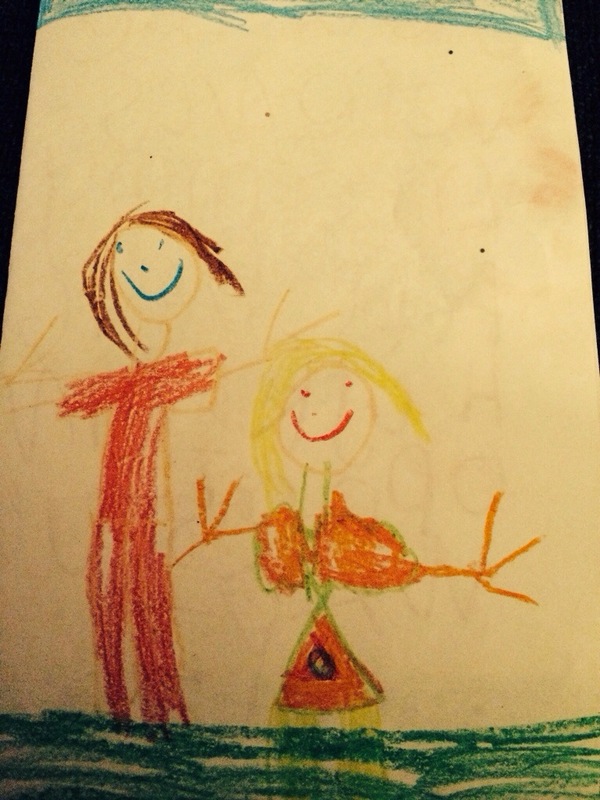 My daughter loves me and that is something to be proud of. 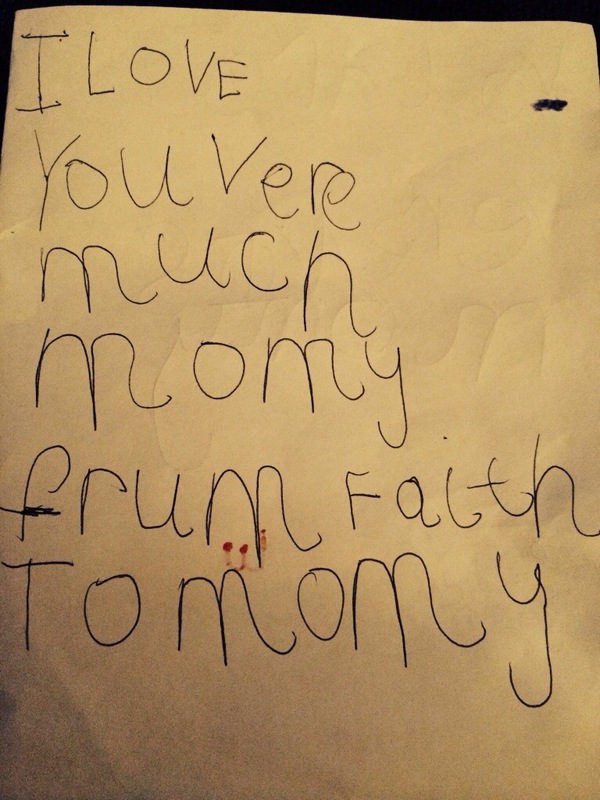 This entry was posted in Uncategorized and tagged cards, Faith, mom on March 18, 2014 by Becca. I took the kids to Squirrel Lake park yesterday. I almost invited another family to go along with us, like I typically do, but decided that we should go alone. I love bringing others with us because it keeps the kids more entertained and it gives me someone to socialize with. However, when I have a friend with me I don’t usually play with the kids. I tend to talk to the other mom while the kids play near us. I decided that this trip needed to be used for quality time with the my kids. I picked up Faith from school and we headed right over to the park. As usual, they were not interested in the playing on the playground equipment. Instead they wanted to go throw things in the water and go exploring in the woods. To “go exploring” means that the kids play down by the creek, dig in the sand, and eventually fall into the water. It was a warm day so I wasn’t too worried about them getting wet. It took about twenty minutes before Wilson slipped on the rocks and fall into the water. He got his pants and shoes wet but he didn’t seem to mind too much. We walked through the woods and along the water to see where “the water started”. I had a very nice time with the kids. It was fun to see them so excited. The four of us laughed a lot, threw giant rocks into the stream, and climbed on a fallen tree. Lately I have felt as if I haven’t spent much quality time with the kids. I see them all the time, but I don’t always consider it “quality time”. Quality time is time that we spend together without the distraction of other people or screens. It is time that I am focused on them and the activity at hand. We spend a lot of time in the same house together, but we are not always playing together. Yesterday we spent many hours at the playground together enjoying each others’ company and doing something slightly different. It was a great day to be a mom! 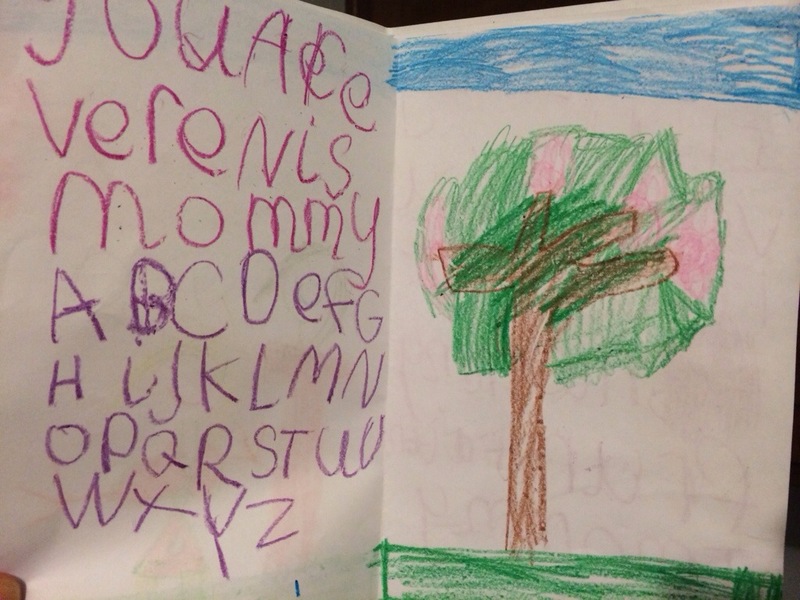 This entry was posted in Uncategorized and tagged kids, mom, quality, time on March 15, 2014 by Becca. Today we celebrated my Dad’s 64th birthday. His birthday is really tomorrow but since today is Wednesday and all of the kids are at his house anyway, today was the day to celebrate. a meeting. Last time we had a cake at that time none of the kids ate dinner when they got home. Doug asked if the kids could eat first and then Have cake. This meant that mom was to feed all of the kids first since they were at her house all day. Being the super mom that she is she some how managed watch five kids, bake a delicious three later cake, pick up kids from school and make a spaghetti dinner for everyone. In typical Wilson fashion, there was lots of talking, laughing and children. 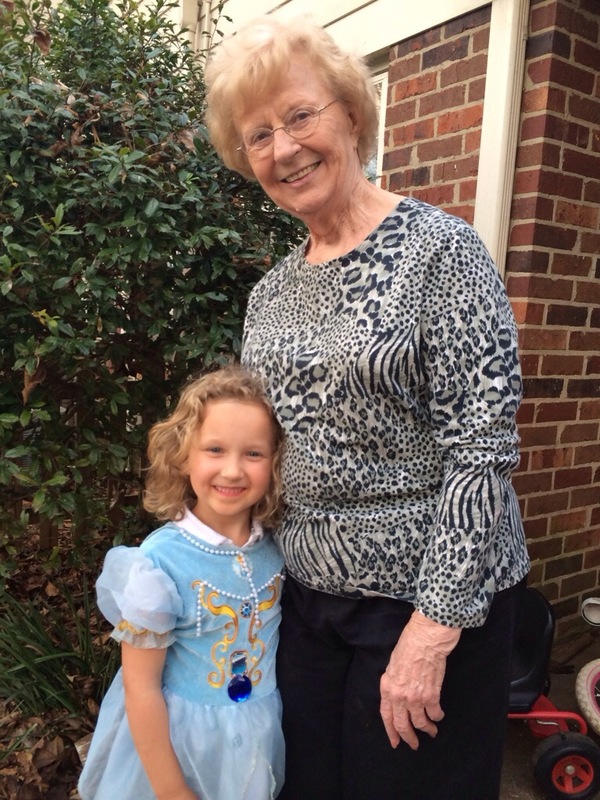 Grandmama Pat even came over for the celebration. 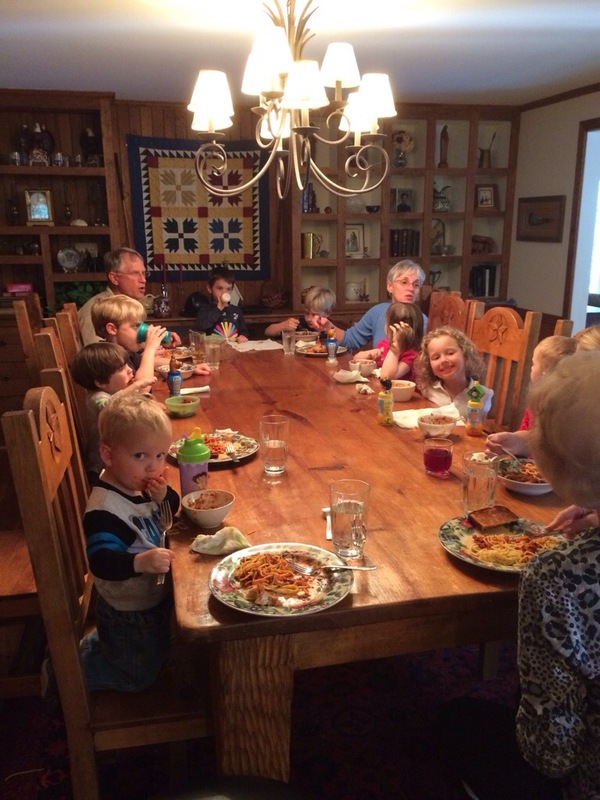 In all, there were fourteen people around the dinner table enjoying spaghetti and cake and celebrating Dads birthday. Wilson wanted to help blow out the candles. John snuck in and blew them out the first time so mom relit them and let Wilson do it the second time. Never a dull moment!! 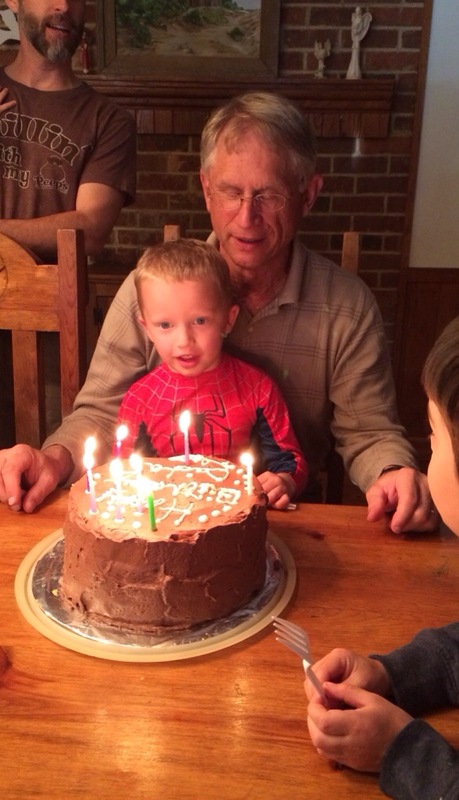 This entry was posted in Uncategorized and tagged birthday, dad, steve on March 12, 2014 by Becca. Miller is now 27 months old. I love it when they turn two because then I can just say that he is “2”. It is much easier than counting months. But for the sake of accurate blogging and remembering how old, or young, he actually is, I will say that he just turned 27 months old….a young two. The things that he can do and say at this age amaze me daily. He knows most of his colors, loves to draw, and can do puzzles without the picture under the piece. He can count to ten and sing part of the ABC song. His vocabulary and verbal skills are quite abundant. He says things like, “I want to watch the Neverland Pirates, Mommy.” or “I don’t want the blue blanket.” or “Let’s go outside and play soccer. Come on!” I love that he can communicate so clearly. Of course, some of the words are ones that only a mother could understand, but others are quite clear. Today I leaned over in the car, kissed his cheek and said, “I love you, Miller.” He told me for the first time, “I love you.” It almost made me cry. His athletic interest and skills are also amazing. He can set up and hit a tee-ball, dribble a soccer ball across the field, swing a golf club and actually hit the ball, and throw a frisbee (in the wrong direction). Not bad for a two year old. He even slept with his soccer ball last night. You could say that he is a bit obsessed. I am hoping that his interest in sports will lead to a very lucrative job when he grows up. For now, I am just trying to play with him in the front yard as much as possible. He enjoys it and it is nice to get outside. He will occasionally get into trouble, but not often. His biggest crime is dumping a bucket of blocks out and refusing to help clean them up. I put him into time out (which he doesn’t mind), but he will help clean up after that. He does copy me occasionally which isn’t always a good thing. This past December he looked at Faith one day and said, “Shush it, Faith.” Shush it!?!? Where did he get that?, I thought. Then I realized that he got it from me. I never even realized that I said it, but he did. It was very funny and cute when he said it, but it had to be controlled. Everyone was being told to “shush it!”. Even me. I am trying to remember so much about this time in his life. I am so glad that I can write all of this down and have it to remember later in life. I have enjoyed being able to watch him grow and learn. Physically he is still pretty small, but I like it. I can pretend that I have a small baby for a little while longer….a small baby that talks, reasons, and plays sports. This entry was posted in Uncategorized and tagged growing, Miller, older on March 10, 2014 by Becca.